Summer is almost here and the kids will be out of school soon. Parents all know the struggle to keep them entertained without losing your mind. 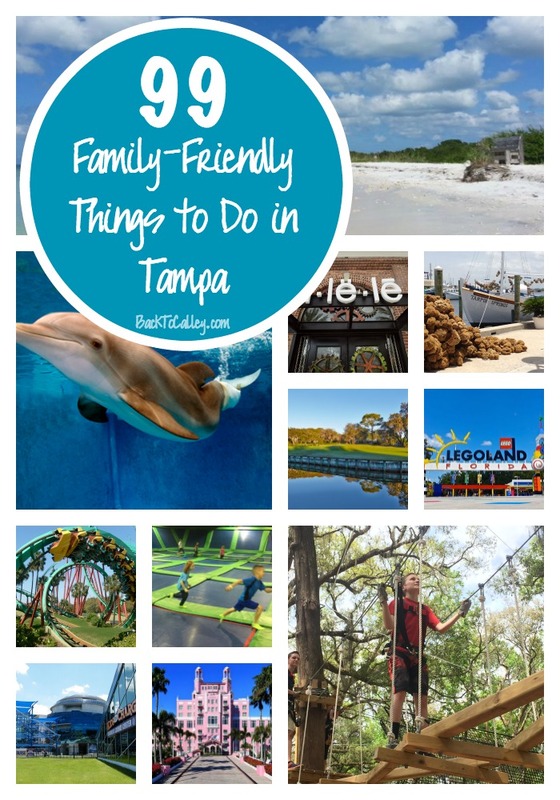 Whether you’re visiting the Tampa area on vacation or you live in the Tampa area, this list of things to do includes stuff for the whole family. There are a few items on the list that are a short drive outside of Tampa. Honeymoon Island Beach – this is our favorite local beach located in Dunedin, FL. It’s less crowded and easier to get to then going to St. Pete and Clearwater. You can play on the causeway for free, or enter the state park and enjoy the natural beaches of North Pinellas County. Soak up the rays on the beach, take a nature hike, play on the playground, or take your pet for a walk on the dog beach. Great for all ages. Parking is $8/car (up to 8 people). Caladesi Island Ferry & Beach – Rated one of Dr Beaches top beaches in 2008, this beach can only be reach by boat. Take the ferry from Honeymoon Island State Park or park your own boat at the Caladesi docks. Standup Paddle Boarding – Go on a stand-up paddle board tour with Upper Tampa Bay Paddle Sports. Tours are available locally in the Tampa Bay area and in surrounding areas within an hour drive. Tours include board rental and a guide who knows the area well. Great for kids and adults. Tarpon Spring Sponge Docks – Located just north of Clearwater, the Tarpon Springs sponge docks is a great destination for shopping, authentic Greek food, and seafood. Shop for olive oil, homemade soaps, sponges and sea shells, and local artisan shops. Dolphin Cruise – There are several places you can view dolphins in the Tampa area from the beach, or you can go on a dolphin sightseeing cruise from St Pete, Clearwater, or Tarpon Springs. Clearwater Marine Aquarium – Meet the animal stars from the Winter movie; Winter, Hope, Mavis, Rufus and their friends at the Clearwater Marine Aquarium. Your family can see some of the locally rescued animals being rehabilitated; many will be released back into the wild once they are healed. Locals can attend summer camp at Clearwater Marine Aquarium or volunteer to help. Florida Aquarium – Located downtown Tampa near Channelside and the Port of Tampa, the Florida Aquarium is a fun place to see local fish and sea life. Pack the kids swimsuits so they can play in the splash park when they are done exploring the aquarium. Busch Gardens Tampa – If you like theme parks and animal life, you’ll love Busch Gardens. You can visit elephants, cheetahs, lemurs, and giraffes or ride a thrilling roller coaster! Check out the new Falcon’s Furry and coming soon Cobra’s Curse coasters. Save a little money with the all day dining passes. Adventure Island – Need to cool down in the Florida heat? Spend a day next door to Busch Gardens at the Adventure Island water park. Get lazy in the Rambling Bayou or get crazy on the Colossal Curl. Legoland – About an hour outside of Tampa your family can play with Lego’s all day, ride Lego-inspired rides, or cool down in the Legoland Water Park. Plan a weekend away to do both parks and stay at the Legoland hotel right outside the park. Be sure to stop by Miniland USA to see all the fun Lego creations inspired from cities around the world. For a great snack get the apple fries and a slushie!! Tradewind Islands Resort – Go for the day, or stay for the weekend. Either way, Tradewinds Island Resort is a fun place to enjoy St Pete Beach. Their floating ocean water park and beach slide is fun for all ages! There are 5 swimming pools, cabanas, paddle boats, tennis courts and great food! The Floating Water Park is a fun way to get active in the water and stay cool in the summer. Visit a Library. Libraries can be a lot of fun for kids. In addition to endless books for them to read, most local libraries have activities for kids during the summer. Many of these events are even free! Visit the Pinellas County Library Cooperative or Hillsborough County Public Library Cooperative to locate the library closest to you. We love the Tarpon Springs, Palm Harbor, Oldsmar and Countryside libraries. Attend a Vacation Bible School (VBS) at a local church. Check with the local churches near you to see when their summer VBS events are. Many are free for kids in K-5th grade and lots of fun. MOSI – Are your kids interested in science and technology they’ll love MOSI (Museum of Science and Industry) in Tampa. There’s a planetarium for them to learn about the stars and planets, a flight simulator, an IMAX theater, Disasterville, and a ropes course with zip lining. Glazer Children’s Museum – Located in downtown Tampa, Glazer is great for younger kids and school age kids. They can pretend to be vets, firemen (and women), artists and scientists in the exploration zones. Kids can visit for free on the first Tuesday of the month from 2-7pm. If they still have energy after playing inside visit Curtis Hixon waterfront park next door and play on the playground over looking the bay. Trolley ride downtown Tampa – Don’t walk when you can take the TECO Line Streetcar around downtown Tampa. Ride all day with unlimited stops for only $12.50 for the entire family. Amalie Arena events – There is always something fun going on at Amalie Arena including sporting events, concerts, and shows. Watch a Tampa Rays Baseball game – Floridians know how to do sports, indoors! Take the kids to the ballpark and enjoy baseball or go to see the real life rays at the Rays Touch Tank. Be sure to check the schedule for promotional days and concerts. Clearwater Threshers Baseball – The kids may enjoy Bright House Field and the minor league Threshers for a baseball game. The stadium is outdoors, but features a fun playground for the little kids and a lawn in the outfield to relax in. Go to any Tuesday night game for only $1 (sitting in the lawn) and enjoy $1 hot dogs and drinks! Dunedin Blue Jays Baseball – More baseball fun, this time in downtown Dunedin! Within walking distance to the downtown Dunedin shops and restaurants. See the Manatees at Homosassa Springs – Homosassa Springs is a State park about an hour north of Tampa. There is an underwater observation area for viewing the resident manatees. You’ll take a short boat ride from the main entrance of the park out to the springs and can learn about Florida manatees and other local wildlife. Other residents at the park include Lu the hippo, some black bears and Florida alligators. See the mermaids at Weeki Wachee Springs – That’s right, see real life mermaids swimming in the springs. You can also take a river boat cruise and see animal shows. When you’re done at the park, you can swim in the springs at Buccaneer Bay next door or paddle board, kayak, or canoe down the river. Explore a new playground. Ask any local and they’ll tell you their favorite local park. Some of our favorites include Wall Springs Park (Palm Harbor), Curtis Hixon Park (Tampa), the park at Countryside Library, and Phillipe Park (Safety Harbor). Go Fishing – Pack up the fishing poles and take your family fishing in a local lake, pond, river, or in the ocean. Early morning and late afternoon are the best times and you will find locals fishing just about everywhere it’s possible to fish. You can even go out on a fishing charter for a little more fun. Innisbrook Golf Resort & Spa – Located in Palm Harbor, just North of Clearwater, Innisbrook is a great resort area with a spa, swimming pools, tennis courts, restaurants, and some of the best golf courses in the area! Lowry Park Zoo – If your kids want to see elephants, giraffes, chimpanzees, and other wildlife you can visit the Lowry Park Zoo in Tampa. Check out their Summer Sunset Celebration dates and enjoy live entertainment as the sun sets. Family bike ride down the Pinellas Trail – Grab your bikes and helmets and hit the Pinellas Trail! You can ride the trail from Tarpon Springs south to St. Pete and enjoy stops along the way. The trail is a good place for bikes, skates, or just for an afternoon walk. Dali Art Museum – Let your little artists and art lovers explore the art work of Salvador Dali. Through June 12th you can see the Disney and Dali exhibit. Sunset at Pier 60 on Clearwater Beach – The nightly sunset celebration starts at 5:30pm each evening with local artist and performers. Explore Historical Fort Desoto – Fort Desoto has been named a number one beach in the US more than once and features more than 7 miles of white sandy beaches, a historical fort, playgrounds, and a campground on the ocean. Go for the day or sleep overnight in the campground. Fort Desoto is one of my favorite beaches in the area!! Tampa Storm Arena Football – Have you ever seen an arena football game? We had season tickets last year to the Tampa Storm and my kids loved it! My husband loved that he could watch football in the summer! The season runs from April – July and the Storm play their games at Amalie Arena. Sunset at Frenchy’s Rockaway Grill Clearwater Beach – One of my favorite restaurants to take friends to is Frenchy’s. Be sure to go about an hour or two before sunset and be prepared to wait during the summer months. Grab a cocktail for the adults and some She Crab Soup! They have a kids menu with chicken fingers, grouper nuggets, and other regular kid-fare. Request to sit on the deck and watch the sun go down, then let the kids go play in the sand when you’re done. Take a water bike on the Tampa Bay – Rent a water bike from the Tampa Bay Water Bike Co and see the bay! It’s a fun way to explore the city and be on the water at the same time. If you have smaller kids, they may prefer the tandem kayaks with you. Zip Line through the forests in Dade City – About 45 minutes North of Tampa in Dade City is a fun zip line and ropes course, Treehoppers. It’s great for the 7+ crowd and way more fun for the adventurous kids! My son (13) has spent hours tackling all of the different courses, my daughter would prefer to stay on the practice course. Escape from jail at Escape Countdown – This is something my kids have been begging me to do, but we just haven’t found the time. It’s a group activity where you are locked in a room and given clues to find your way out before the timer runs out! Go to a Broadway Show! The Straz Center brings Broadway events to Tampa. In July you can take the kids to see The Wizard of Oz. Meet Bob the Builder, the Little People, and Barbie at Westfield Malls – During the Westfield Family Summer events you can meet your favorite character as they perform live stage shows, crafts, and meet-and-greets with the kids. Select dates at all Westfield Malls. Attend Camp Creativity at Michael’s Craft stores – Every Monday, Wednesday and Friday this summer you can leave the kids at Michael’s for 2 hours as they create a fun craft project. Sessions are only $5 so register early. This summer’s adventures include the Land of the Dinosaurs, Under the Sea, and Life on Pluto. Be a pirate for a day – Captain Memo’s Pirate Cruise leaves from Clearwater Beach daily for an adventure on the high seas! The band of pirates play games with the kids while you get to relax and see the beaches from the ocean. Cruises last for 2 hours and end up back on Clearwater Beach. Go play with the Dinosaurs – If you’re headed out towards Plant City you may have seen the giant T-Rex off the exit. Dinosaur World has over 200 life sized dinosaurs hanging out in the woods waiting to meet your kids! Don’t worry, they’re all fake but it makes for some great photo-ops with your kids. See the TECO Manatees in Apollo Beach – At the TECO Big Bend Power Station you can view wild manatees from the boardwalk or the observation tower. Sunken Gardens – Meander through paths with lush exotic plants, waterfalls and gardens in St. Pete at the Sunken Gardens. Be sure to bring your camera. Florida Botanical Gardens – More fun with plants and wilderness can be found in Largo at the Florida Botanical Gardens. They have a fun Children’s Trail with educational stops to teach kids about what they are seeing. Jump at an indoor trampoline arena! Airheads Trampoline Arena has locations in Tampa, Clearwater and Orlando. Stay for an hour or stay for the day! They have special jumping areas for younger kids, fitness courses, teen parties, and dodgeball. Check out their Facebook page for special events all summer long! Lions and Tigers and Bobcats, oh my! Visit the Big Cat Rescue in Tampa and help end abuse and private possession of big cats. This is a sanctuary for cats who have been abandoned, abused, or saved from slaughter. No children under 10 years of age admitted. Suncoast Primate Sanctuary – Located in Palm Harbor is a quiet little sanctuary where primates of all kinds spend their days retiring from their past lives as performers and pets. All of the animals at the sanctuary have been rescued or adopted from situations where their owners couldn’t take care of them any longer. This is a non-profit organization and all of the “employees” are volunteers. Old McMickey’s Farm – Spend a day on the farm with the goats, cows, pigs and chickens! Guests will get to interact with the animal’s, milk a cow, and go on a hay ride. My kids love holding the chickens and seeing them laying on eggs in the coup. Go kart racing – Visit the Tampa Bay Grand Prix and race your friends and family on their indoor go kart tracks. Kids must be 48″ to drive. See drive-in movie at Fun Lan – Fun Lan is located off Hillsborough Ave in Tampa and has 4 screens showing current movies for adults and kids. Pack up the car and take the kids to the movies! Croc Encounters – If you’re looking for a wild place, Croc Encounters has gators, snakes, and lizards galore! Visit on Saturday’s for a self-guided tour to see what they have to offer. Celebration Station – Your kids won’t be bored here! They can play arcade games, mini golf, lazer tag, go karts, bumper boats, or batting cages. There’s something fun for all ages, but I would recommend this place for 7+ to get the most fun out of your day. Pass-a-Grille Beach – Located at the tip of St. Pete as far as you can go is the most beautiful little beach in town. When I was little my grandma use to take us here when we visited her in St. Pete. The beaches are white and sandy and you may be able to see some sand dollars as you’re playing in the water. Be sure to stop along the roads leading in and out of Pass-a-Grille to visit with the pelicans, there are some great spots for viewing them. Sand Key Beach & Park – A great place to spend the day on the beach with huge sandy beaches and fun playgrounds. Heritage Village – Step back in time and visit the living history museum in Pinellas County. This 21-acrea park has historical homes, fire engines, water towers, school houses and churches that will make you feel like you’re in historical Florida. Sprayground Fun in Dunedin – Put on your bathing suit and splash around at the Kiwanis Sprayground for free. More splash park fun in Tarpon Springs – This is one of the newer splash parks in town and a lot of fun! Downtown Tampa Splash Pads – For some of the best kept splash pads, head downtown to Water Works Park! Attend a Saturday Kids Workshops at Home Depot stores and take home your own creation. Build & Grow at Lowes with your kids on Saturday mornings. Leepa Rattner Museum of Art at the Tarpon Springs campus of the St. Pete College. Visit their eight galleries and view paintings, drawings, ceramics and photography with your kids. Play disc golf in Clearwater! Played like regular golf, but with frisbees instead of clubs and balls! Go on Safari at the Giraffe Ranch in Dade City – It’s not a zoo or a theme park, but a real farm and wildlife preserve. You’ll see giraffe’s, hippos, camels and rhinos. Weedon Island Preserve – Over 3,000 acres of natural Florida to explore along with rich cultural history. Take a guided tour, nature hike, walk down the boardwalk, or visit the historical center and learn about the area. Attend Summer Camp – There are far too many summer camps to list in the Tampa area!! Some of our local favorites include Camp Cubber and Camp Wai Lani. Mommy Spot Tampa has a great list of Tampa area summer camps. Camp out at a Florida State Park – Pack up the tent and take your family camping this summer! We loved camping at Fort DeSoto since you could fish from your campsite and walk to the beach. Borrow and donate a book at a little library – You might not find a list of all the little libraries listed anywhere since they are typically community build boxes and not owned and operated by anyone. I know of two that are new additions by some local Girl Scout Troops here in Palm Harbor. You can find one outside of the Centre in Palm Harbor and one at Putnam Park. Geocache – Grab your phone or a GPS and create a Geocache account. The maps will lead you to a cache hidden someplace around you. It’s a game that anyone can play and it’s free. Skate board at the Ian Tilmann Skatepark in Safety Harbor. It’s free and open to the public. Just bring your board! Safety Harbor Resort & Spa – Treat yourself to a day of indulgence and luxury at the Safety Harbor Resort & Spa. Make it a family fun day and play in the pool or explore the west shore of Tampa Bay. Rent a boat for a day – Call the local marinas and ask if they rent boats. There are several boat clubs and rental locations around the bay! Rent a kayak for a day – Head down to the Dunedin Causeway and rent a kayak to explore the area on your own. You’ll see parts of the island that you can’t see from land and little beaches you can’t get to by car. American Victory Ship Memorial Museum Ybor City – Visit the SS Victory, an old war ship that’s been in WWII, and the Korean and Vietnam Wars. Florida Railroad Museum – A short drive South of Tampa in Parrish, FL is the Florida Railroad Museum. You can board a train there for an hour and a half train ride all year round. This summer, kids ride free with a paying adult. Tampa Bay History Center – Learn a little more about Tampa downtown at the History Center. Kids can look, touch, listen and learn about cattle ranching, Tampa trains, and the pioneers of Tampa Bay. Replay Museum Tarpon Springs – If you like arcade games and want to show your kids how much fun the “old school” games can be, this is your place! A one-day pass is only $13 and you can play all the games for free! Dunedin Fine Arts Center – Take an art class, visit the Children’s Museum, or view fine art in one of the galleries. Organize a neighborhood block party and meet your neighbors. Find a Food truck – You can find all of the local food trucks listed here: Tampa Food Trucks, Tampa Food Truck Rally, Food Trucks In Tampa, and Flicks and Food Trucks downtown Tampa. Organize a beach cleanup. Grab a few friends and some trash bags. Take the family to Ulele for dinner and dine with Princess Ulele. Some of the best dining in Tampa Bay is downtown on the River Walk at Ulele. Be sure to get the chargrilled oysters and a beer from their brewery (for the adults). The kids will love their house-made Ulele Ice Cream selection! Explore the River Walk downtown Tampa and watch the sunset or play on one of the many Tampa playgrounds. Tampa Museum of Art – Visit one of their private galleries or one of their traveling exhibits or take a summer workshop. Hyde Park Fresh Market – Held the first Sunday of each month, there are 50-70 vendors for local food and hand crafted items. Grab a Twistee Treat – Treat yourself to something sweet at the big ice cream cone! Their soft serve cones are great. We go to the Tarpon Springs Twistee Treat, but new locations are being added to the Tampa Bay area. Night in the Islands Events in Tarpon Springs – Dinner, dancing and live entertainment under the stars at the Sponge Docks. You’ll feel like you’re in Greece. Rock the Park Concerts at Curtis Hixon Park – Rock out to local bands and artists the first Thursday of each month. Visit a Florida natural spring – If you want to get out of town and explore more natural Florida you can click the map to find all of the natural springs in the State. We really love tubing down the Ichetucknee Springs in North Florida. Brooker Creek – Another great preserve in Pinellas County with over 8700 acres to explore. Dress up and take the family to Bern’s Steak House in Tampa – This is usually an “adult” outing, but kids are always welcome at Bern’s. Bern’s Steak House is one of the oldest restaurants in Tampa and has some of the best steaks you’ll find anywhere. Be sure to take them on a kitchen tour and visit the dessert room. Bern’s is a dress establishment so pull out your Sunday best! Rent a hotel on the beach and have a stay-cation! Kids (and adults) love hotels! Get a hotel room on the beach for a few days and pretend you’re a tourist. Watch airplanes take off at TPA – Go to the top deck of the economy parking lot and you can see planes taking off and landing. Parking is free for the first hour! Hammock Park in Dunedin – Take a nature walk, play disc golf or play on the playground. Take a trip on the Jolley Trolley – Routes start as far North as Tarpon Springs and take you to numerous locations along Palm Harbor, Safety Harbor, and Clearwater Beach. An unlimited day pass is only $5 and you can get on and off as often as you like. Dine with the fish at Guy Harvey’s RumFish Grill – Located on St. Pete Beach, the RumFish Grill features a 33,500 gallon aquarium that takes up an entire wall of the dining room. All of the fish in the tank are indigenous to the Tampa Bay area and the Gulf of Mexico. Collect Sea Shells on Shell Key – Take a ferry out to Shell Key in St. Pete for some of the best sea shells the area has to offer. Visit the Pink Palace! The Loews Don CeSar Hotel was opened back in the height of the Gatsby Era in 1928 and can’t be missed from anywhere in St. Pete Beach. You can come visit the Pink Palace, dine in one of their restaurants, and reserve a room right on the beach! Bring the whole family, including your four-legged friends because the Pink Palace is pet-friendly! What did we leave off the list? 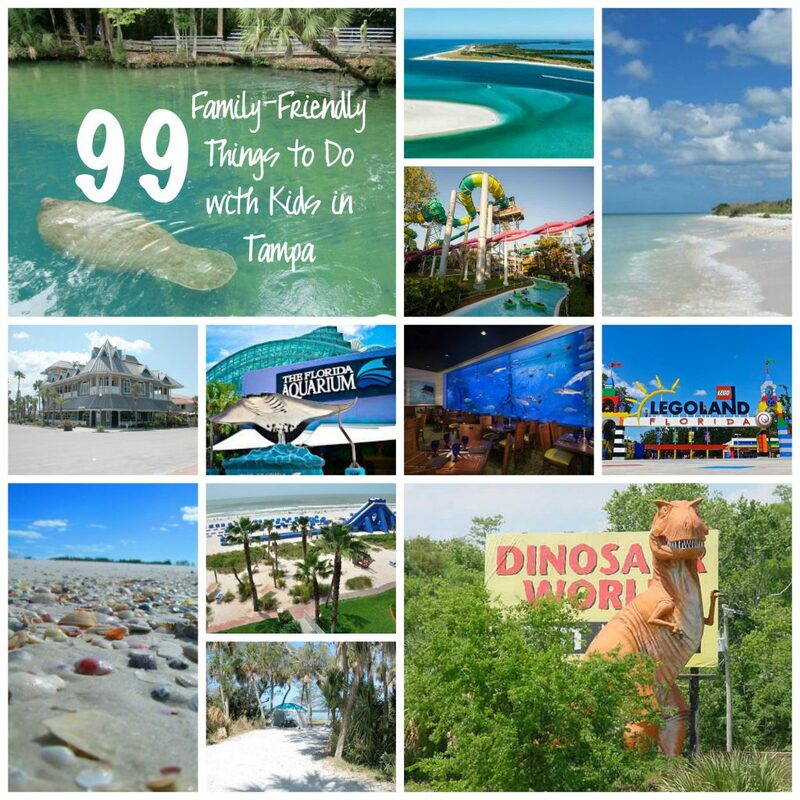 Feel free to leave a comment with your own family-friendly things to do in Tampa this summer. Pin and Share this list! Bookmarking! What a fabulous list!!! Great list! I think my favorites (that I tried so far) are Weeki Wachee during the day and Clearwater at night.